Fatty polish in a specific paste for greasing softening, protecting and waterproofing shoes, harnesses and objects in leather and impregnated skin. Notes: An old formula, produced by hand as it was 80 years ago, poured into the cans while hot and closed as soon as the ideal temperature has been reached. The craftsmanship of the workforce means that some differences in consistency or colour nuances may occur. Respect the environment: Does not contain animal fats. This product is also available in 100 ml. and 200 ml. Apply the product on the surface to treat with a piece of cotton wool or cloth and wait until it is absorbed completely. Rub energetically with a woollen cloth to obtain a shiny effect. Camperos style shoes and boots, Texan boots, leather sneakers, football boots and boat shoes, trekking and sports shoes in general, saddles and harnesses for equitation. Polishes leather, brushed, hammered, printed, reptile, nappa an particularly delicate leathers, suede, nubuck, peccary, alcantara. 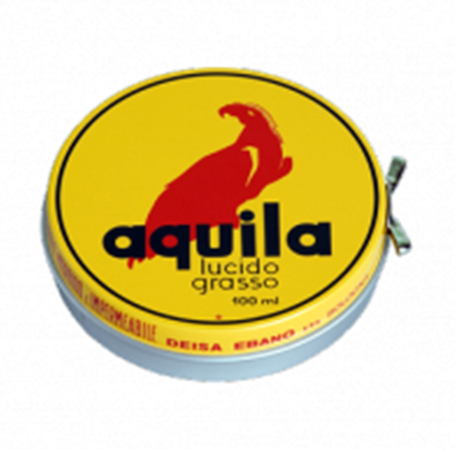 Synthetic waxes, oils and Vaseline make Aquila Grease a powerful protector for open-grain leathers. It deposits an impenetrable layer of nourishment that is waterproof and resistant to atmospheric agents on the surface and in depth.